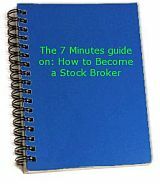 How to find a stock broker is not as dificult as it seems. Although finding a stock broker to handle your equities transactions is a very important process, it is equally important that you first know and understand your own investment policy and the particular services that will suit your own particular investment needs. Discount brokers do not offer advice, recommendations etc. They simply carry out the stock trading process according to your instructions, nothing more nothing less. After being sure of what type of service you need from your stock brokers, here are some tips that will help you along the road. Find a stock broker that you can easily get in touch. Interview a lot of stock brokers before you decide, choose only the one you are comfortable with, who understands your investments goals and needs. Ask friends, co-workers of their stock brokers, how and why they choosed their stock broker. Check and confirm that the stock broker is duly certified. Experience: The more experience the stock broker has, the better. Fees: There are diferent rates of commissions and fees, so its better you find out the one most suitable for your investment needs. Check out also the history of the stock broker, what is his ethical code? Return from "find a stock broker page" to a"ll about stock market home page"